The AA Road Race Series (see http://www.almostathletes.co.uk/road_race_series_2011.html ) has a marathon option. Since many members put a huge amount of work preparing for a marathon each year it seems right that this effort should be recognised. However it is clearly unfair to specify a particular marathon in the same manner as the shorter races, so that a new set of rules must be devised. The idea is that (almost) any marathon time achieved during year will be recorded a being achieved in a single event open to all members. Points will be assigned when the results of all the marathon runs are known. In principle, all marathons which are open public events and whose results can be readily verified are eligible. The AA Committee retain the right to exclude any events which are not easy to verify or could give an unfair advantage. The event may be longer than 26.2 miles but not shorter. As a guide the 100 Marathon club (see http://www.100marathonclub.org.uk/ ) publishes a list of marathons that meet its criteria. Any member contemplating a marathon not on that list, with a view to this challenge, is advised to contact the club Committee at the earliest opportunity to consider its eligibility. The marathon must be run between the inclusive dates of 1st January and 30th November of the current year. The AA Member is strongly encouraged to wear the club top but allowance will be made for overriding circumstances such as when running for a charity who provide their own top, and in inclement weather conditions when further clothing such as a jacket is required. The AA Member is responsible for promptly reporting the details of their achievement including date, event, time and method of verification (e.g. web page reference) to the Road Race series organiser - currently Steve Adams. Time should be 'chip time' if available, otherwise gun time. Only one marathon time for each member will count. But if a member runs more than one marathon in the period and the subsequent time is better than the previous best, the member should report the new time. This process can be repeated any number of times. Members will be divided into the same age and gender groups as for the rest of the Road Race series. At the end of the period (30th November), the members in each age + gender group will be ordered on time and points awarded in the same manner as for the other races in the Road Race series. The AA Committee are reponsible for ensuring this operates in a fair and transparent manner. They are empowered to modify and override the rules if necessary to ensure natural justice is maintained. It is appreciated that some marathons are 'easier' in terms of terrain, actual distance, weather conditions etc. It is the member's responsibility to choose one or more events that are suitable for achieving a good time. If the event is an ultra marathon, but the organisers also publish a properly measured marathon time, this time might be allowed (subject to AA Committee approval) for the purposes of this challenge, otherwise the finishing time of the event must be used. The aim of the challenge is to encourage members to undertake a marathon. It is recognised that many will enter popular events such as Brighton or London, but other events including those more local such as Worcester and Stratford upon Avon, as well as those overseas should all be included. Marathons with an off-road or multi-terrain element are also eligible, but achieving a quick time is likely to be more difficult. It is hoped to 'adopt' a relatively local marathon that a number of members can jointly train for. This is not part of the formal structure at present but members are invited to make suggestions. Snow, rain and sunshine buoyed the Almosts at races both home and abroad last weekend. The Gloucester 20 was lapped up by Mark Lyes, whose soaring run peppered the three hour threshold. Oliver Bell and Michelle Carroll stuck together until three miles from the end, with Carroll's 2:32 pushing Bell's 2:31 all the way. 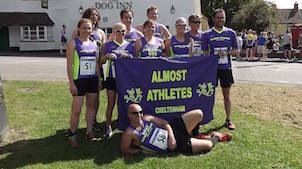 Eddie Munro, evergreen Evan Stanley, Mark Medland, Dominic Lyes, Karen Hilton, Norm Lever and Barry and Chris Walker gave their all.In the Reading Half, new member Mark Denley finished in 1:28 and Dave Elliott 1:43. Husband and wife team Mark and Anne-marie Willicott's synergy scored a searing 3:46 at the Rome MarathonJo with John Galpin producing 4:12. More results from the Carterton 10K and the St. David's coastal Marathon. A freezing cold Sunday morning yielded some red hot performances at the Blackminster Half. Jeanette Gullick was first lady home for the club in a wonderful 1:46, Debbie Minett scored a new Personal Best of 1:53. Mark Willicott claimed 1:35, Eddie Munro was first MV60, and Helen Fursman and Barry Walker celebrated PBs of 1.47 and 1.57 respectively. Ingrid Harris, Thom Stephens and Dave Elliott took part in the Grizzly while Rebekah Stephens and Paul Thomas took on the Grizzly Cub race.